Wholesale Hotels Group - Wholesale Hotel Prices for your travel agency! Move beyond the customary ten percent to twenty percent discounts available at hotels when you make online bookings. When you do get the chance to make windfall gains, during off-peak and shoulder seasons, the available properties with generous discounts are few and far between if you pinpoint a location or select some of the more recognized hotels, resorts or motels. One of the many things that plague the hospitality industry is inflated pricing and subsequent application of a discount. This makes offers seem amazing and the eventual savings worthwhile but you are effectively paying a much higher rate than you should. The only way you can save big is with wholesale hotel prices. You know that and I know that. Wholesale hotel prices are like the deals you get at your local wholesale shopping clubs. These brands have established themselves as wholesales for hundreds of goods. You can purchase products at prices that were erstwhile available to wholesalers and nationwide or regional distributors. Needless to say, consumers rarely get access to such prices. This is why certain shopping clubs have become so popular in recent years. Wholesale prices are the way to go and it is all about getting it to the consumer. At the local shopping club whose name starts with a “C” and ends with an “O” allows access to those deals to individual users by charging a membership fee. 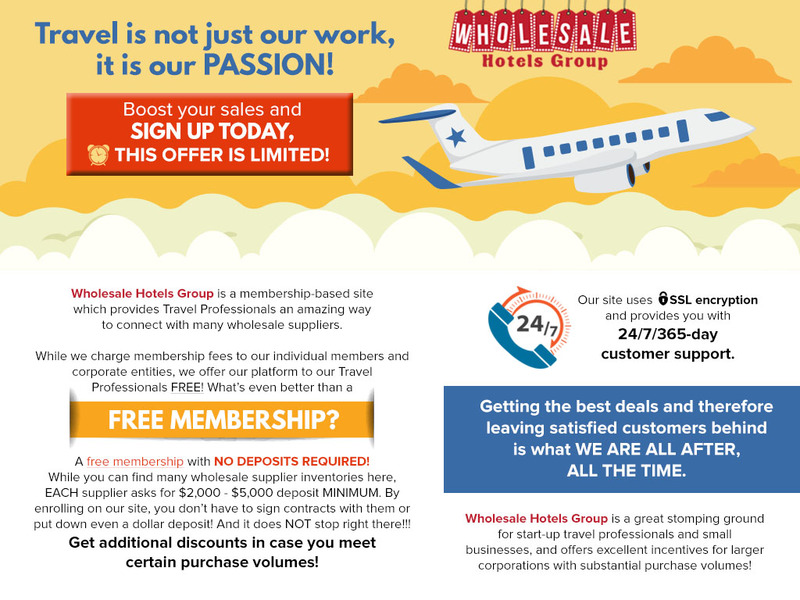 If you wish to explore the kind of deals you can get, then you ought to check out what Wholesale Hotels Group has to offer. Wholesale Hotels Group is not an ordinary travel company. It is not an online reservation site or a travel agent. It is not an aggregator site that relies on data available on other similar websites to promote a certain range of prices and accordingly facilitate the bookings. Wholesale Hotels Group works with a network of wholesale suppliers, DMCs, and consolidators, wherein they make bulk reservations. Having secured wholesale hotel prices, the company passes on the savings to travelers. You may be an individual, an organization, a government entity, a group of people or a travel agent. You may run a nonprofit organization or a small business. Whatever is your purpose of travel and wherever you are going, you can avail wholesale hotel prices. Do not be surprised at the magnitude of savings with wholesale hotel prices. They are significantly lower than those inflated rack rates, which effectively mean you pay as per the standard tariff. You can pay half price at places when you compare the rates listed online across travel sites and aggregator websites. Wholesale Hotels Group and their wholesale hotel rooms can help you save hundreds or even thousands of dollars over a multi-night stay. If you are an individual user, our plans start from only $4.99 for a 7-day membership, but Non-Profits, Travel Agencies, Tour Operators, DMCs and Government entities can sign up for FREE! Wholesale Hotels Group – Wholesale Hotel Prices for your travel agency!